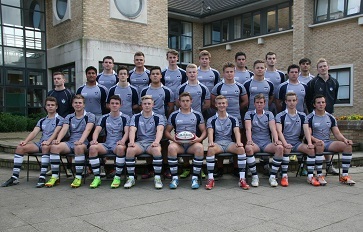 Rugby players in the First XV at The Grammar School at Leeds (GSAL) are hoping to repeat the national cup-winning ways they enjoyed as U15s, when they play in the final of the inaugural Champions Trophy next week. With most team members now in the Upper Sixth at GSAL, the First XV is largely the same as the successful U15 team that lifted the Daily Mail Schools Rugby Cup at Twickenham in 2012, and a second national title would be the perfect end to their school rugby careers. The Champions Trophy is a new U18 competition introduced by the Rugby Football Union (RFU) and its schools arm, the England Rugby Football Schools Union (ERFSU). This year’s pilot involved 32 teams from England’s top rugby playing schools and the competition is completed in the autumn term, freeing up talented players to fulfil playing commitments for club, academy and country in the new year. The team booked their place in the Champions Trophy final after an exciting 29-15 semi-final victory played at GSAL against Barnard Castle School. The final will be played at Allianz Park, the new home of Saracens Rugby Club, on 26 November against Millfield School. Captain Sam Ward said: “Considering the muddy conditions we had a good game in the semi-final. Our impressive defence in the second half kept them from scoring again until the very end.